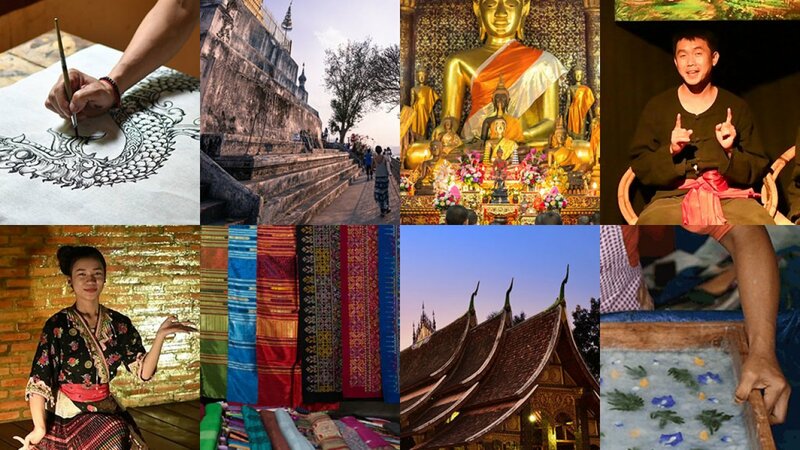 Fire up your imagination as you listen to the myths, legends and folktales behind the Mekong River, Mount Phousi and other famous landmarks of Luang Prabang. Hear about the exploits of legendary characters recounted by a Lao storyteller in an intimate theatre. The stories are accompanied by the haunting sounds of a ‘khene’, a handmade bamboo mouth organ, played by an elderly musician dressed in tribal clothes. Support this captivating duo who are preserving the ancient tradition of Garavek storytelling. One of the highlights of Luang Prabang is getting up early to photograph the long lines of saffron-clad monks silently making their way through the empty streets. 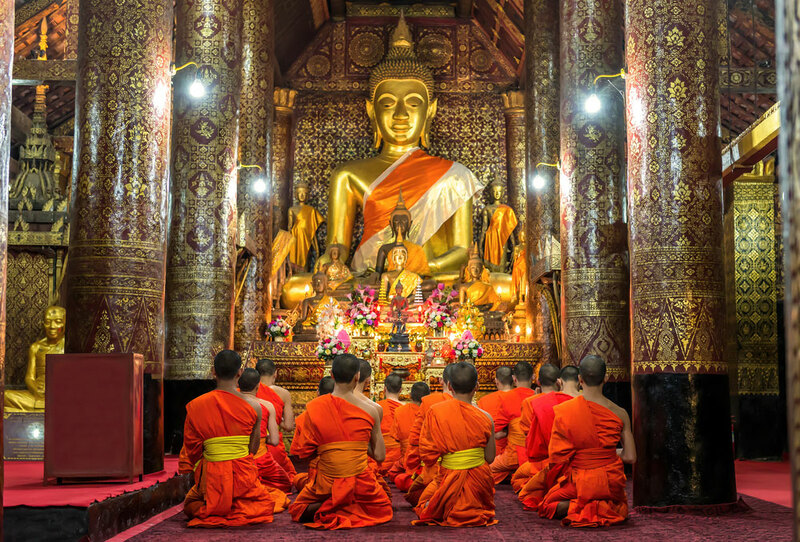 However did you know that if you visit the temples in the evening, you can witness the monks and novices meditating and hear them chanting? And why not join them? The sanctity of these ancient temples offers a calming atmosphere to get in touch with your inner thoughts through your own meditation. Every evening at dusk the capital’s main street comes to life as street hawkers and sellers set up their stalls under bright red awnings. As the sun goes down over the Mekong, you can practice your bargaining skills with the traders, many of whom are from remote hill tribe villages. Pick up ethnic handicrafts such as paper lamps, opium pipes, woven textiles, embroidered bed covers, wood carvings and silk scarves. When you need a break, stop at a pushcart for a freshly blended smoothie or a chocolate crepe. Combine two Laotian experiences and attend a cultural performance with dinner. Enjoy the spicy flavours of Lao cuisine with an array of delicious and authentic dishes. Watch dancers perform age-old sets that include interpretations of the Ramayana, rural life, folk tales and legends. Performers in elaborate masks and exquisite silk costumes demonstrate their flexibility through graceful movements. The dances are accompanied by music played on traditional instruments such as drums, fiddles, xylophones, lutes and oboes. Great Instagram pics can be taken of the rhythmic bamboo dance in which the dancers skillfully jump over moving bamboo poles. 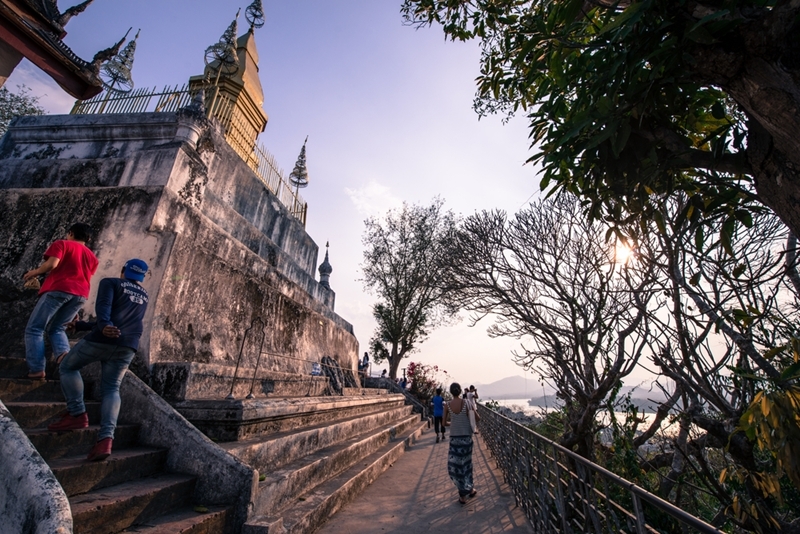 Mount Phousi, Luang Prabang’s sacred hill, rises 100 metres over the town. In the late afternoon, along with many other tourists and locals, slowly make your way up the hundreds of steps to the summit. Yes it’s busy, but that’s because it is renowned as the best sunset spot. So get there early and spend time enjoying the panoramic views. As the evening draws in, capture the reflections of the sun in the river and the golden glow as it slowly disappears behind the mountains. 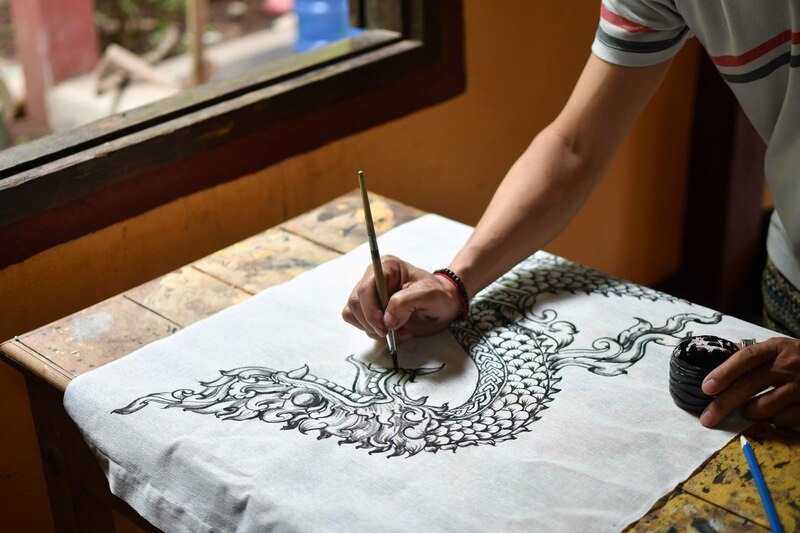 Have an arty evening in the villages of Ban Xang Khong and Ban Xieng Lek, the paper-making and weaving villages. The paper, also known as ‘saa paper’, is made from the bark of the mulberry tree. See the pressing process and the resulting paper drying in the sun. 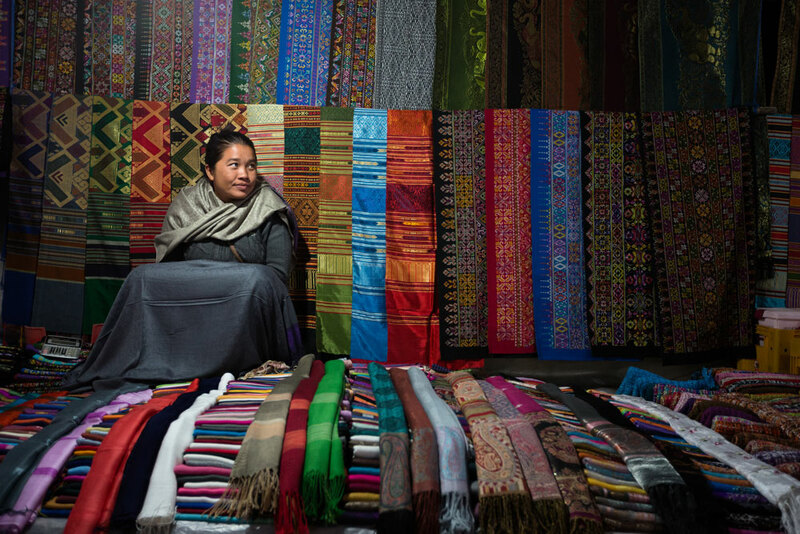 Wander into the weaving workshops where artisans weave naturally dyed silk and cotton on traditional looms. You can buy intricately designed silks and textiles as well as reasonably priced notebooks, fans, artworks and scrapbooks. Thone is a local artist helping to preserve the exquisite art and decorations found in temples and other ancient buildings. From his home on the bank of the Nam Khan River he uses traditional artisanal techniques and skills to produce beautiful paintings. He currently sells his artworks in the night market giving you the opportunity to get your hands on some unique creations. Some of his traditional murals can also be seen adorning the walls of hotels and restaurants in Luang Prabang. Sometimes it’s enough to just slowly stroll through the winding streets taking in the beauty of the temples in the evening light. Pass by Wat Visoun (Wat Wisunalat), the oldest living temple in the city containing a collection of antique wooden Buddha images. See the unique architecture of That Makmo, also known as the Watermelon Stupa. 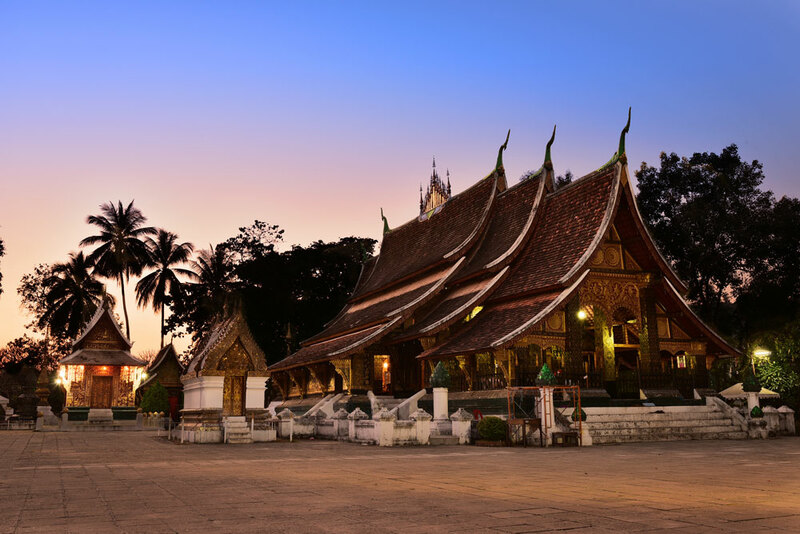 But save most of your time for Wat Xieng Thong, Luang Prabang’s best-known and most visited monastery. The three tiered roof sweeps low to the ground and the walls have been beautifully decorated in black lacquer and gold leaf. The back of the temple features an intricate glass mosaic of the tree of life set on a dark red background.